Within a given area, the diversity and abundance of plant species and their respective functional traits are indicators of change in resource availability at multiple scales. 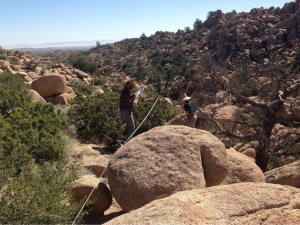 We have established marked transects and quadrats on the Burns Piñon Ridge Reserve to study plant community dynamics over time and across areas expected to vary in solar radiation and soil moisture. 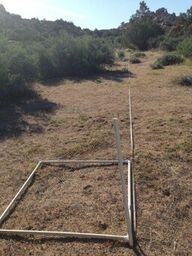 Three point-intercept transects have been established that are each 50 meters in length, with ten associated 1m x 1m quadrats adjacent to the transect line. On each transect the total number and average size of individuals per species is recorded. On two of the three transects, an extra 3 quadrats are located under randomly selected shrubs within 10 m of each transect line. Transects are replicated across flat areas, north-facing slopes, and south-facing slopes. Vegetation transects among contrasting topographies. 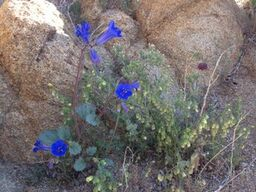 Phacelia campanularia and Emmenanthe penduliflora in bloom along piñon pine- juniper transect. 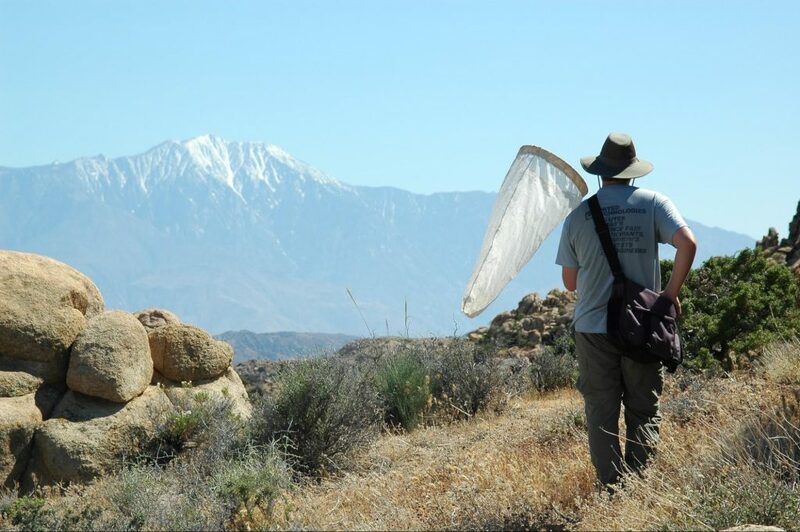 Dr. Jeff Lozier on a collection expedition to the Burns Pinon Reserve with the Essig Museum of Entomology, UC Berkeley, 2005. Based on collections made in Oregon and California, the authors redescribe 7 beetle species, elevate 1 species from synonymy, and describe 10 new species. A portion of the collecting activities focused on the understudied Transverse Ranges of southern California. 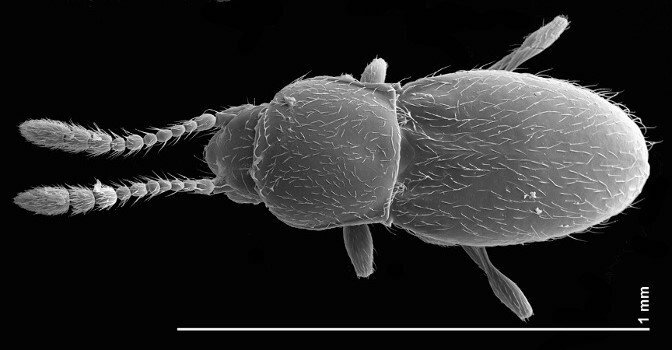 The holotype for one of the new taxa, Oropodes serrano Chandler & Caterino, sp. n., was collected at the Burns-Piñon Ridge Reserve. The authors describe and illustrate seven new species of beetles collected from central to southern California. These collections increase the representation of the genus Cephennium in the Nearctic region and extend the genus’ geographic range from the San Francisco Bay region south to the eastern Transverse Ranges of southern California. SEM image of Cephennium aridum from the Burns Piñon Ridge Reserve. Image provided by Mike Caterino. Loik, M.E. 2008. 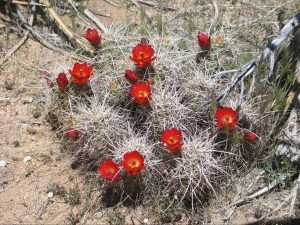 The effect of cactus spines on light interception and Photosystem II for three sympatric species of Opuntia from the Mojave Desert. Physiologia Plantarum 134(1): 87-98. Spines were removed from the stems of three species of cacti to determine the effect of spines on light interception, plant tissue temperature, and pigment content. 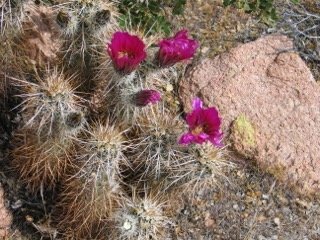 Spines had no effect on stem temperatures of any species, and they substantially affected photosynthetic activity and pigment composition only in the cactus species with the greatest spine density. Regus, J.U., C.E. Wendlandt, R.M. Bantay, K.A. Gano-Cohen, N.J. Gleason, A.C. Hollowell, M.R. O’Neill, K.K. Shajin, J.L.Sachs. 2016. Nitrogen deposition decreases the benefits of symbiosis in a native legume. Plant Soil Doi: 10.1007/s11104-016-3114-8. The study examines effects of increased soil nitrogen concentrations via atmospheric N-deposition on legume-rhizobium symbioses. The researchers measured atmospheric N-deposition rates across a predicted deposition gradient, used isotopic analyses to assess the relative importance of mineral nitrogen and biologically-fixed nitrogen to the legume Acmispon strigosus, and exposed A. strigosus plants from contrasting depositional environments to a controlled nitrogen gradient. They found that (1) plants from higher-deposition environments have higher total nitrogen content, (2) plants in higher-deposition environments incorporate a larger percentage of nitrogen from mineral sources, and (3) the growth benefits of rhizobial nodulation to the plant are reduced under higher-nitrogen conditions. Smith-Downey, N.V., J.T. Randerson, and J.M. Eiler. 2008. Molecular hydrogen uptake by soils in forest, desert, and marsh ecosystems in California. Journal of Geophysical Research 11: G0307 (11 pages). Thompson, S.D. 1980. Microhabitat Use, Foraging Behavior, Energetics and Community Structure of Heteromyid Rodents. Doctoral Dissertation, Department of Ecology and Evolutionary Biology, University of California, Irvine. Herring, M. August 1997. Burns Pinyon Ridge Reserve. University of California Natural Reserve System, Oakland, California. 4 pp. Bowler, P.A. and S. Brown (eds.). 1987. Proceedings of the California Oak Heritage Conservation Conference, March 11, 1983. Published by the Sea and Sage Chapter of the Audubon Society, Santa Ana, California. Bretz, W.L. 1987. The University of California Natural Reserve System: A partial collection of California Oak and Oak-Associated Natural Resources. Pp. 110-121 in Bowler, P.A. and S. Brown (eds.). 1987. Proceedings of the California Oak Heritage Conservation Conference, March 11, 1983. Published by the Sea and Sage Chapter of the Audubon Society, Santa Ana, California. Conkelton, S.1984. University of California Directory of Photographic Collections. Compiled for the California Museum of Photography, University of California, Riverside. Vasek, F.C., H.B. Johnson, and W.W. Mayhew. 1975. Piñon Woodlands of the California Reserve System. A Report to the University of California, Natural Land and Water Reserve System as Part of a Resource Inventory. Department of Biology, University of California, Riverside 92502. Unpublished Report, 9 pp. Plus 2 Tables and 2 Appendices. University of California, Systemwide Administration. July 1, 1975. University of California Property Atlas.